Subtle landscaping techniques can protect your home from intruders. 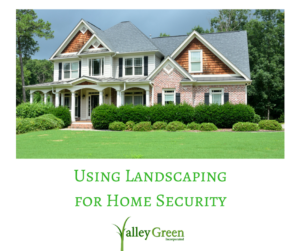 There has been an uptick in landscape fleets receiving requests for using landscaping for home security. Subtle landscape techniques can easily deter would-be thieves. How you landscape your client’s yard, side yards, and backyard can either increase or decrease their home’s vulnerability. It can also affect how appealing it is to potential burglars that may be casing their neighborhood. When quoting clients on using landscaping for home security, you might want to offer the following ideas. Trim tall trees close to the home: This will lessen the chance of an intruder using the tree as a way to access upper windows to break in. Shorter trees will also prevent squirrels and other animals from gaining access to their roof. Make sure they keep up with their mowing: An unkempt lawn can give the impression that a homeowner is away on vacation. Remind them that your fleet should mow regularly to ensure the lawn looks well maintained. Trim back shrubbery: Intruders will often hide in bushes will casing homes. Ensure that your clients have well-trimmed bushes and shrubs to prevent this. If they choose to have bushes close to home entrances, choose thorny types like roses. Keep your perimeter bushes or fence low: Law enforcement recommends that you keep perimeter fencing and bushes to a three-foot tall maximum. This ensures your yard can be easily seen by passing cars and concerned neighbors. Thieves do not like to take the risk of being seen. Encourage your clients to put away their own lawn tools: This will discourage thieves from using shovels etc to break windows or doors to access your home.